When canning your own food, you'll occasionally get a jar, or a batch of jars, that fail to seal after processing. While frustrating, it's a problem that can easily be resolved by reprocessing the jars. Here's how to figure out why your jars didn't seal, and how to reprocess them. There's was a chip on the rim of your jar. Run your finger along the rim of each unsealed jar to see if you can feel any chips or nicks. If you find one, transfer the contents to another jar and reprocess it. Any imperfections along the lip of the jar will prevent it from forming a good seal with the lid. The jar wasn't filled properly. Successful canning requires that there by a specific amount of headspace between the food and the top of the jar. This left room for the food to expand when it's heated and ensures that a proper vacuum seal is achieved. 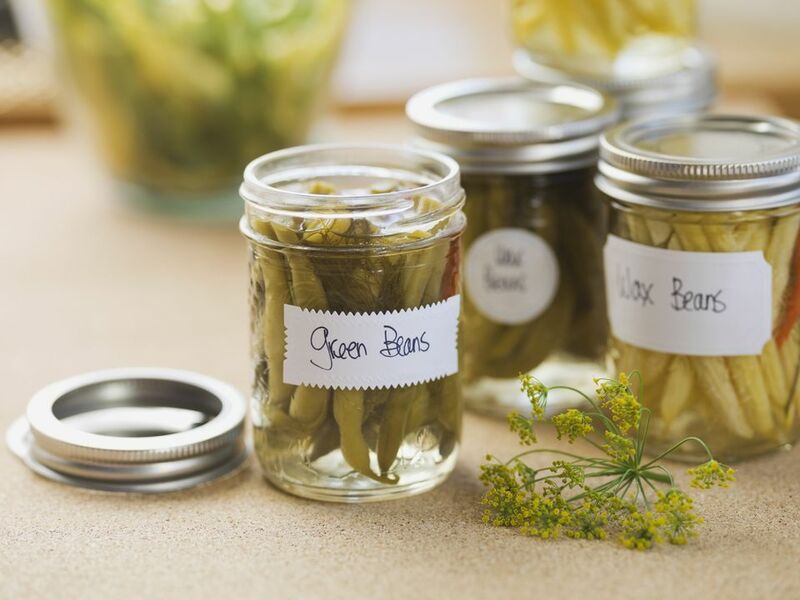 Your canning recipe should specify how much space you need to leave at the top of each jar (it's typically somewhere between a quarter inch and an inch. If you don't have enough food to fill up the last jar, just stick it in the fridge, and use it up first. The top of the jar wasn't clean. After you fill your jars, it's important to wipe the lip clean, so it'll form a tight seal with the lid. If you missed this step, just clean the lip before you reprocess the jar. The ring was too tight. When tightening the ring onto the jar, it needs to be secure, but not too tight. Air needs to be able to escape during the canning process, and a super tight ring may not allow this to occur. You didn't process the jars long enough (or at the proper temperature/pressure). Cutting the canning time short, or failing to keep your canner at the proper temperature/pressure the entire time you were processing your jars may have prevented a proper vacuum seal from forming. You didn't make the necessary time/temperature and pressure adjustments for your altitude. If you're canning at a high altitude, you'll need to make adjustments to the canning instructions provided in the recipe. Occasionally a recipe includes this information, but more often than not, you have to calculate the changes yourself. You used a jar that isn't designed for canning, for example, a grocery store jar. Aside from your water bath canner (or pressure canner) and jars of food, the other canning supplies you'll need is just a fresh box of canning lids to complete the job. The lids are one-time use, and will not seal a second time. Follow these steps, and read through the tips, before trying to reprocess your jars. It may have been a fluke that your jars didn't seal the first time, but it's also possible that you accidentally skipped an important step. At any rate, it never hurts to refresh your memory. Check each jar for nicks along the rim. If you find a nick, transfer the contents to a new jar. If you don't find any nicks, put a fresh lid on the jar and secure it with a ring. Reprocess the jars using the same processing time as before. Then, check for a good seal. If you still have jars that haven't sealed properly, transfer the contents of the jars to freezer-safe containers, and freeze them until you're ready to put them to use. After removing jars from the canner, you should hear a 'ping' as each jar cools. This sound is a good indication that the jar has sealed properly. Not Interested in Reprocessing Your Jars? Just stick your jars in the refrigerator, or freeze the contents in freezer-safe containers. Unsealed jars aren't an indication that there's anything wrong with the food.